Government Sites for Kids - Numerous resources from the Justice Dept, Department of Treasury's, Digital Diplomacy for Students, National Highway Traffic Safety, United Nations and too many others to mention. EdSitement's Lesson Plans and Websites - Offers high-quality material on the Internet in the subject areas of literature and language arts, foreign languages, art and culture, and history and social studies. 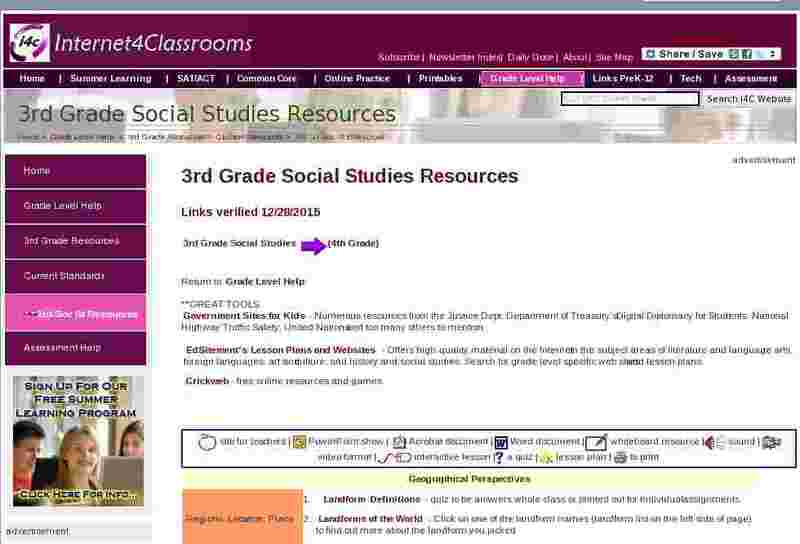 Search for grade level specific web sites and lesson plans. Landform Definitions - quiz to be answers whole class or printed out for individual assignments. Landforms of the World - Click on one of the landform names (landform list on the left side of page) to find out more about the landform you picked. Map Skills - A resource of map skill websites. National Atlas of the United States - Use this interactive service to draw maps of various complexity. I am Responsible - Unit discussing responsibilities. Customs Around the World - Brief introduction to numerous customs in each season of the year. Orientometer - Discover the directions in this interactive game. Climate Map - Check out the climate of the world. Native Americans - Art, Daily Life, Maps, Pictures and Research. History of St. Augustine - The story of the founding of St. Augustine. Explore the World of Early America - Check out the original papers from early times; from obits of famous Americans to maps to biographies and pictures. Life on Plymouth Plantation - Interactive online lesson with many activities. U.S. Territorial Maps 1775-1920- Read and interpret maps on Western Expansion. Reading a Timeline - A timeline of events to interpret in a class lesson. Generate your own timeline - A fantastic site to help students learn to read a horizontal timeline. Each student can create his/her own timeline! A timeline of school events could be created! Only the imagination limits you! Martin Luther King Timeline - His life events on a timeline. PBS Kids Democracy Project - How does government affect your life? Why do we need government? How Laws Are Made - Explanation of the process of lawmaking, tracking a bill in progress. Being a Good Citizen - Instill the virtue of citizenship by explaining the difference between good and bad citizenship. Goods and Services - Online interactive lesson. Delivering the Goods - Online interactive lesson on goods and products. Services - Online interactive quiz about services. Population Study - lesson on Population Crowding in the States. Students will be reading information from graphs, analyzing data and making predictions from the information gathered. Social Studies Curriculum Resources Poster Sets -Individual posters; resources which would facilitate the teaching of social studies standards. Excellent Visuals!